Another year over, it seems in a blink of an eye. 2017 was another busy year here at the Ponderosa. And we are pleased to announce …drumroll please…..THE HOUSE IS FINISHED!!!!!!! There are still lots of little projects to do, but the house proper is finished. 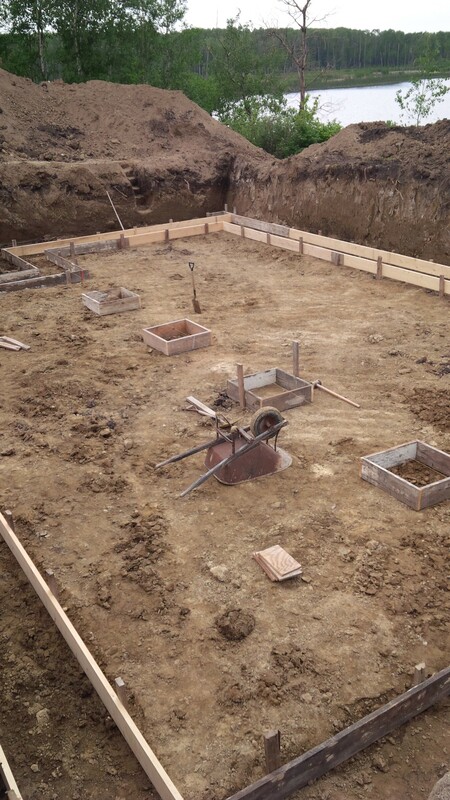 The basement of the house was dug in July 2013. We estimated it would take us three years to finish and I vowed I would not move into the house until it was all done. Ha ha. Turns out it took almost five years and we moved in when it was not much more than a shell. But still I think five years from start to finish is not too bad for two old farts doing most of the work on our own. It’s been exciting to watch the house develop. We learned so much during the process. the entire upstairs – master bedroom, walk-in closet, bathroom, TV room, dormers, bannister and walkways. 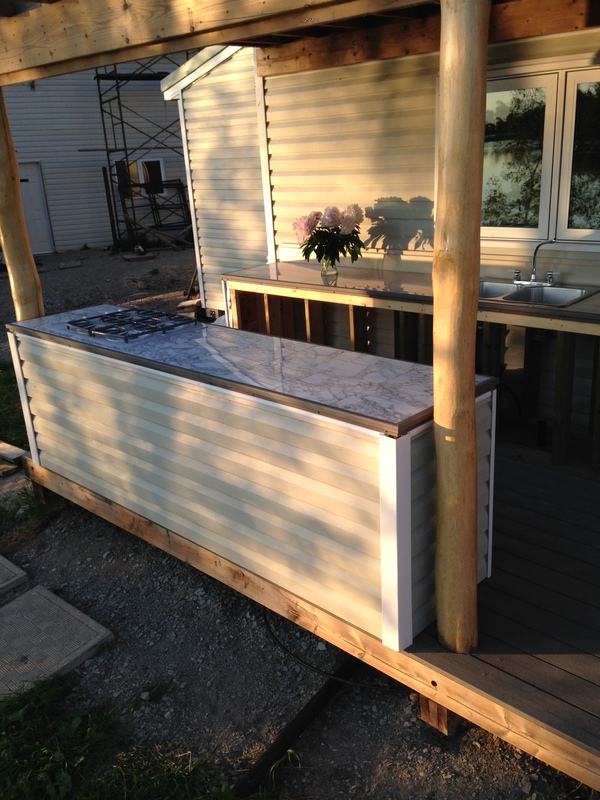 We also spent most of the summer working on outdoor projects – an outdoor kitchen, balcony and some landscaping. Looking back over the year, I am amazed at how much work we managed to get done while spending so much time just having fun. In February, we officially welcomed Megan and her two children, Katie and Tyler, into our family. Kerry and Megan were married in January in a small ceremony in Winnipeg and had a big wedding in Mexico in February. 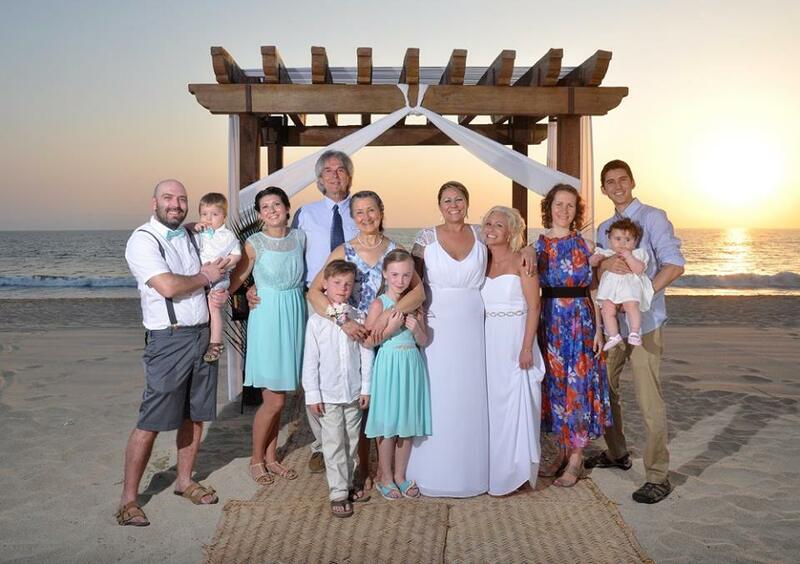 It was great to spend a week in the sun with all the kids, grandkids, relatives and friends. In June, we made our annual trip to BC to visit Christopher, Emily and Astrid in Vancouver and Kelsey, Matt and Jacob in Kamloops. As a bonus, Kelsey and Jacob came back with us and spent an additional two weeks at the Ponderosa. Christopher and a then almost one year old Astrid, came out at the end of June, as well as Kerry, Megan, Katie and Ty, to help celebrate the life of my sister Laverne, who passed away September 2016. In July, I was invited to do a cooking class in Edmonton and took that opportunity to visit with relatives. 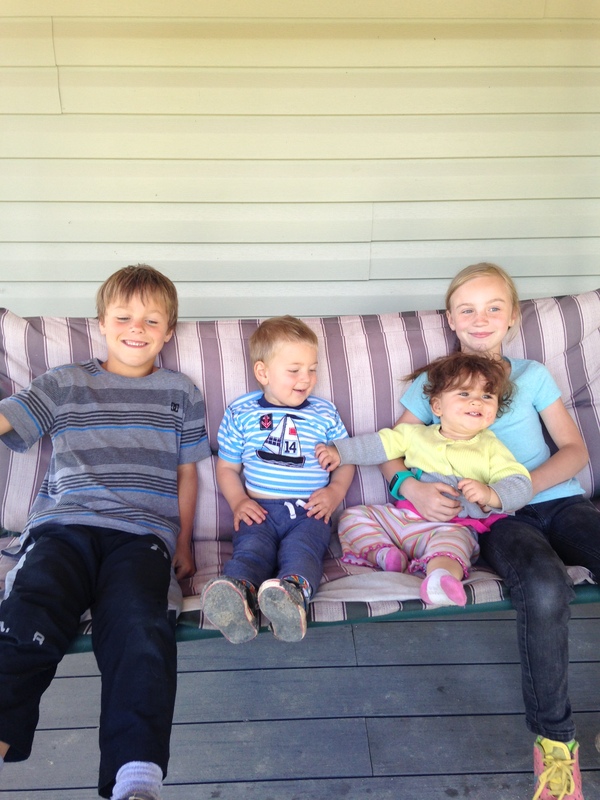 In September, we made another trip to BC to visit the kids and welcome another grandchild into the world. 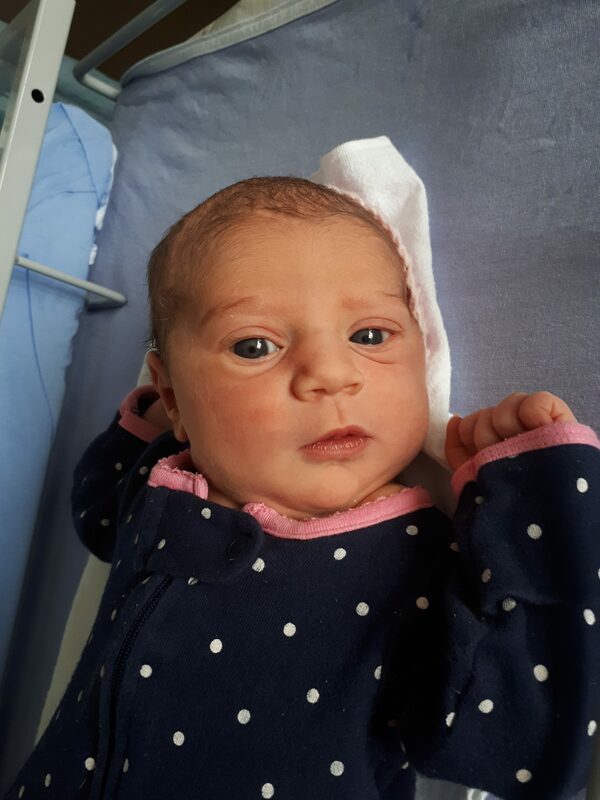 Jacob’s little sister, Nora Joyce Aubut, was born on September 24th. Ken paid the kids and grandkids a visit again in November, before heading to Mexico for a week. In 2017, we also signed up with a program called Workaway, which promotes volunteering, work and cultural exchange around the world. 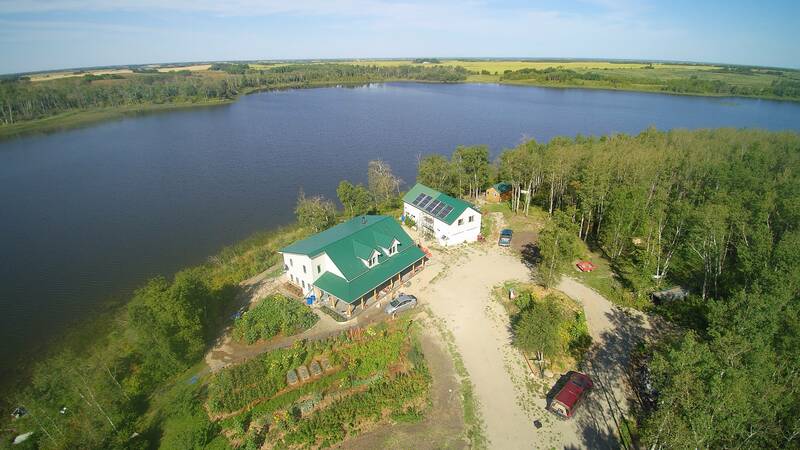 As Workaway hosts, we hosted travellers who were interested in learning more about plant based eating and living off grid. We were lucky to have five fabulous Workaways come stay with us. In exchange for room and board, they worked 20 to 25 hours a week. Shayan from Great Britain and Charlie from Ontario housesat and took care of Hanna and Sox while we were away on our BC trips. 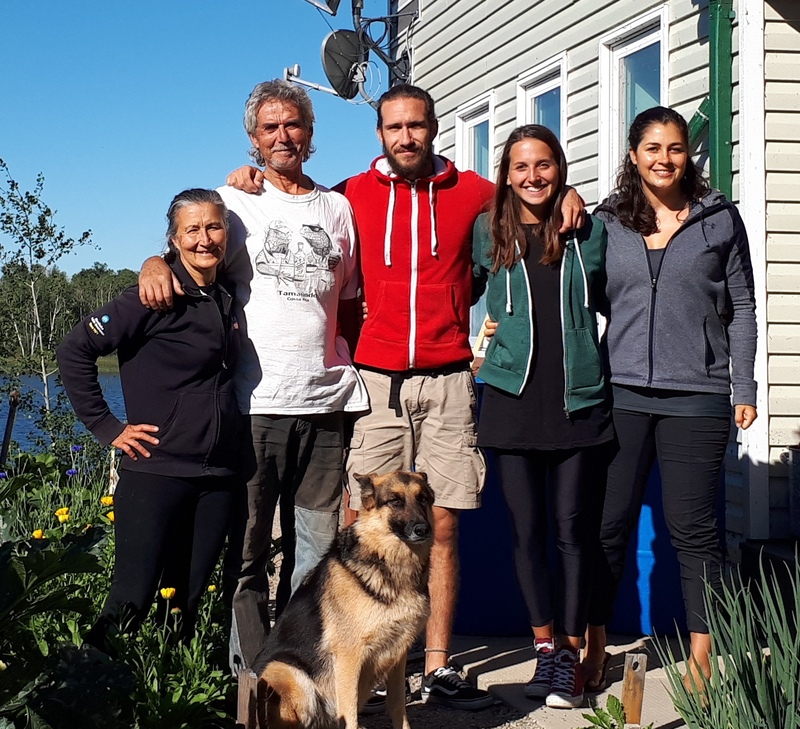 Stevie from New Zealand, and Andrea and Cristiana from Italy helped us with the garden and landscaping. Cristiana led us through our morning yoga routine. We had such fun playing tourist with them as well as cooking and working together. I learned something from each of them, and hope they also learned something from us. 2017 was also time to get back to the books for me. While Ken was busy perfecting his cabinetry skills, I was improving my knowledge of plant based nutrition. I was fortunate to receive a scholarship to the T. Colin Campbell Center for Nutritional Studies and eCornell. In April, I received my Certificate in Plant Based Nutrition. I enjoyed the on-line learning method and the lectures from well-known experts in the field. I am an academic at heart and loved learning the science behind the diet. With building winding down in 2017, we began getting in the groove of daily living on the Ponderosa. We spent more time gardening, foraging, harvesting, preserving and just enjoying a simple lifestyle out here in the bush. 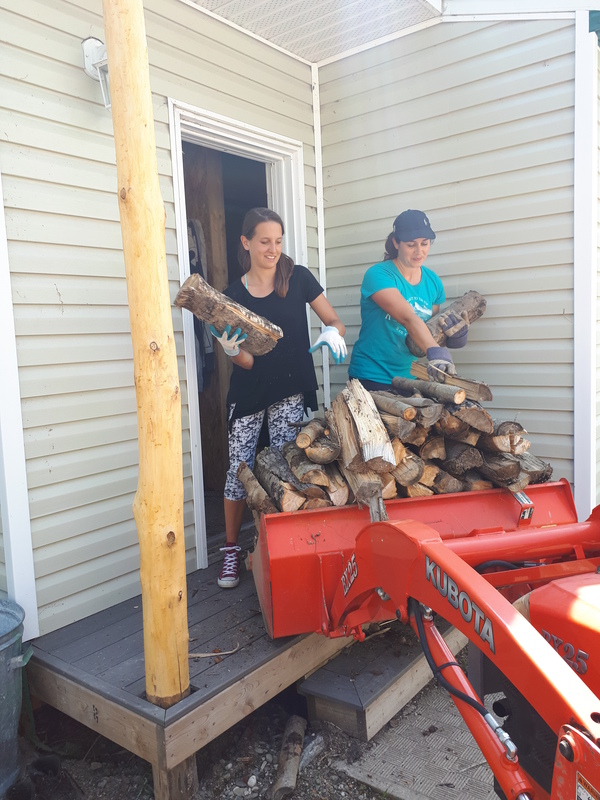 With the help of our Workawayers, we put up a stock of wood for this winter (2017-2018) and have next year’s (2018-2019) already split and drying. And we have started the 2019-2020 pile. The garden was fabulous this year and we used or preserved pretty much everything it produced. 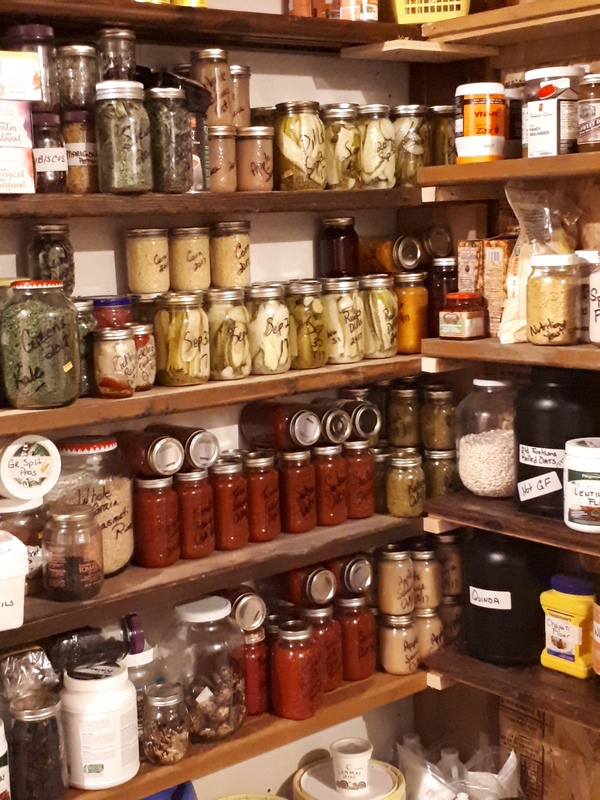 We have a good supply of garden produce stored in the root cellar, canned, frozen and dehydrated, which should take us through most of the winter. 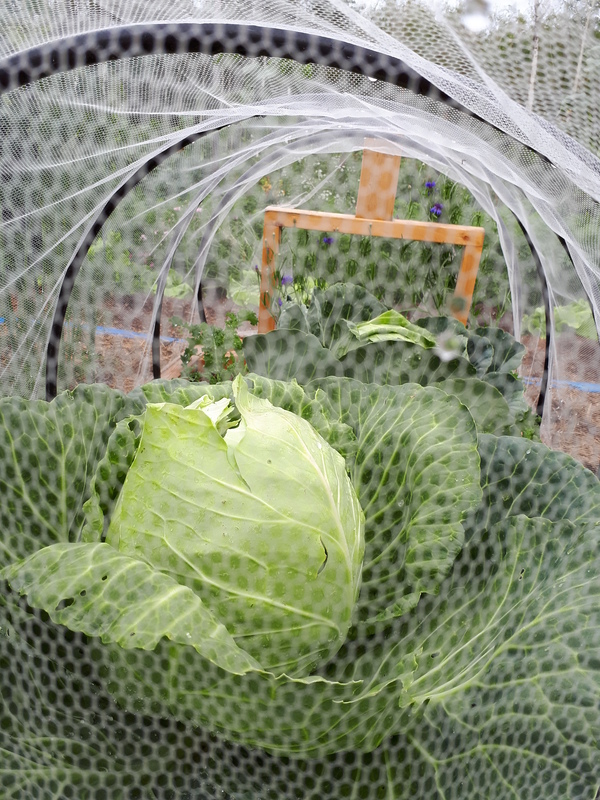 We experimented with different gardening techniques – a mini greenhouse to extend the growing season and netted cages to protect our brassicas from pests. 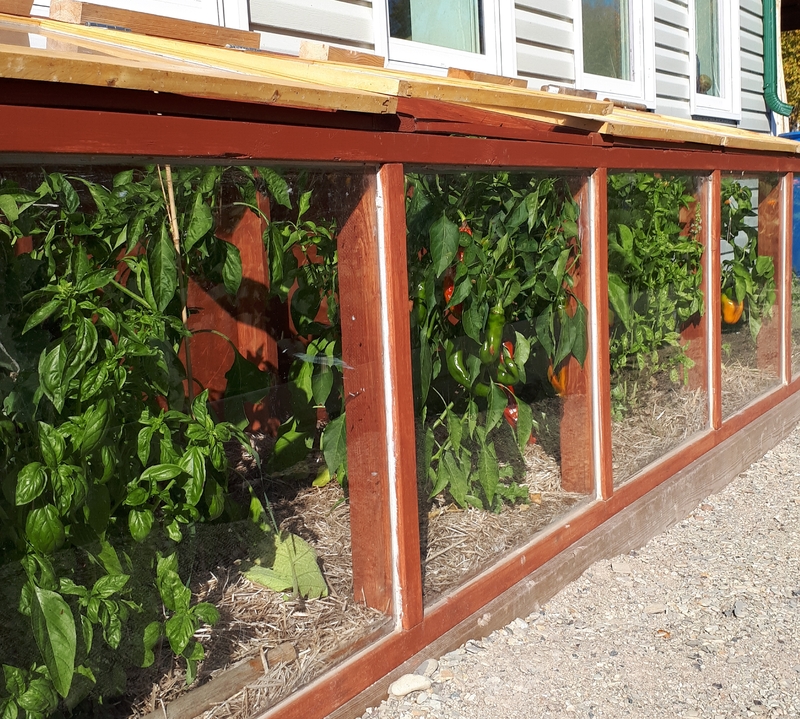 We produced a fabulous crop of sweet peppers and basil in the little greenhouse and grew a great crop of broccoli, cauliflower, cabbage and kale under the cages. We cleared more land so that next year we can expand the garden and hope to put up a bigger greenhouse. We are really enjoying the slower pace of life here at the Ponderosa. Morning and evening walks with Hanna and Sox (yes, our crazy cat Sox loves to come along for walks), snowshoeing the trails during the winter, kayaking and canoeing in the summer, and time for yoga and meditation. Not to forget, time for cooking and baking. This year I ventured more into fermentation – making sour kraut, kim chi, pickles, kombucha, ginger bugs, apple cider vinegar and sour dough bread. There always seems to be more to learn and try. Do we miss city living? No, definitely not, but there are a few things we miss. Ken misses playing slo pitch and bowling. Poor guy, he only got to play one game of ball this summer. As for me, I miss connecting with friends. I travelled to Winnipeg to host a few plant based cooking classes this year but did not find much time to connect with city friends. Hopefully in 2018 we can both find time for these pursuits again. From the Ponderosa to you, we send sincere wishes for a wonderful holiday season and peace, health and happiness in 2018. This entry was posted in Basement, Bathroom, Construction, Decks, Family, Food, Fun, Gardening, Home, Landscaping, Living Room, Outside finishing, Outside living space, upstairs and tagged 2017, year in review. Bookmark the permalink. You both have accomplished so much on the homestead..I know you work from the crack of dawn till dusk. I do not think even my grandmothers/mothers garden produced so much! I remember everyone always in need of jars! Lol! Thanks Theresa. 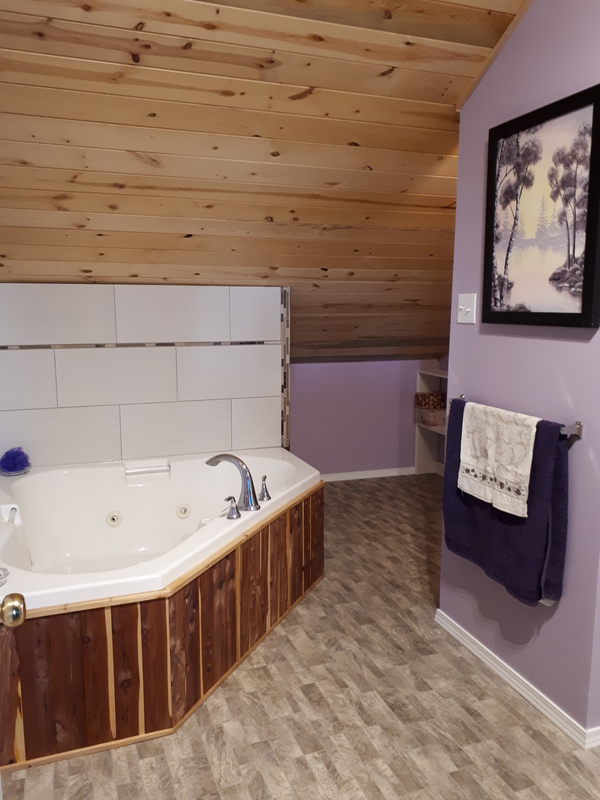 Much of what we accomplished was with the help of your hubby, the pine Curling, the design of the bunk bed in the small bedroom, the decks and more. Ken loves working with him. Hope you two can come out this summer and relax and enjoy. Ps..Have a Happy New Year!